1. at Victory Liner terminal on EDSA,Cubao, there were too many people waiting in line and chance passengers at that since it's also a long weekend besides the popular festival. I decided to queue at the long line even if a sign said there are no more tickets available. When I was near the ticketing window, a man inquired about returning his tickets for he can't make it. At this instance, I offered to buy his tickets to which he acquiesced at the original price, without the opportunistic jacking up of prices, he must be an angel sent to us since he didn't overprice us for his priced tickets. 2. Arrived in Baguio early in the morning, we proceeded to Burnham Park to meet a friend of Novie who'll join us but still there's one problem-- we don't have a place to rest our weary heads for the night since this was really unexpected to materialize. Texted some of our friends and fortunately one was able to refer us to a friend who offered her rooms just outside downtown for such a cheap price. 3. Since the place was quite far, we needed to ride a jeep or taxi to get back to Session Road. Since the street parade's about to start, heavy traffic already built up, we can't find a jeep nor taxi. After waiting for a while, I tried to signal my hitchhiker's thumb to an oncoming truck to which the driver, surprisingly, allowed us to board his vehicle to take us into the center of action. 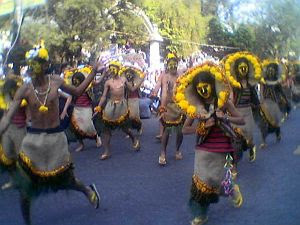 anyway, we did catch the festival parade with a few stars,using Gheng's and Novie's Nokia cellphones with camera. Book your rooms well in advance as well as round trip bus tickets. Prefer rooms near Session Road so that you can walk. Traffic's so bad your car will be next to useless when the parade starts. Get your cams ready, click away! Commute via Victory Liner with station in Cubao, Quezon City for a trip of about 6 to 8 hours. 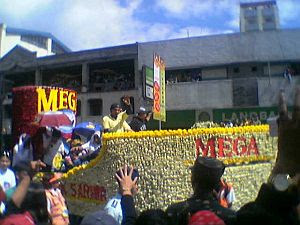 Panagbenga was really fun,all the parade so amazing. oh thanks tutubi,i really enjoyed it good luck to you! your inspired me tutubi,thanks so much. I can't wait to see another more picture tutubi,hope you can post new picture again.Thanks!